Texas-Style’ Chili Con Carne is traditionally a spicy stew-type dish made with predominately beef and chili peppers. Beans and tomatoes were added to the recipe in later years but the ‘Texas-Style’ is still considered the Texan official state food. Variations can include vegetarian, chicken or even turkey chili. Chili Verde is a classic green version that’s made with chicken, tomatillos and roasted green chilies. You can also make a white chili using white beans, white onions, white pepper, green chilies (poblano) and chicken or turkey. 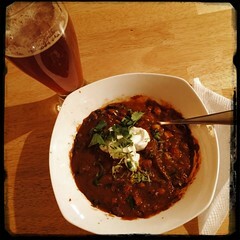 The Grape Gourmet’s Chili Con Carne recipe is a blend of the traditional Texas-Style Chili (stew-beef) and a bean Chili. Using chunks of beef as a nod to Texas-style Chili is a nice touch. The Cilantro, cinnamon and lime juice also contribute greatly. *for an additional zing try adding a spicy Chorizo saugsage (Spanish preferred, but Portuguese works well). 2. Remove meat from marinating liquid (set aside), let drain then dredge the chunks in a mixture of flour, salt, pepper and chili powder. 3. Heat 2-4 tbsp of olive oil on medium heat in a large pot or dutch oven. Fry the pork belly (and/or Chorizo sausages) until well done, remove and set aside. 5. Fry 1/2 the onions and 1/2 the garlic and any dried pepper flakes. 6. When the onions begin to turn translucent and the garlic begins to brown add the beef. 7. When the beef browns add the fresh Poblamo and Jalapeño peppers. Cook until peppers begin to soften, then add the stewed Chipotle pepper (diced w/a bit of the adobo sauce). Cook for an additional 5-10 min. 9. Add 1/2 – 1 cup beef stock and let come to a boil. 10. Lower heat to minimum and add sugar, oregano, salt, pepper, cinnamon and more chili Powder and Tabasco sauce (if you dare for more heat). 1. Add the remaining onions and garlic and cook until the onions show signs of translucency. 2. Add the diced celery and cook for 5-10 minutes stirring occasionally. 5. Add 1 cup of beef broth and let come to a boil, then add the saved marinade. 4. Mix in Mushrooms and cook until mushrooms just turn tender. 9. Add beer (or wine) and let come to boil. 7. Add the crushed Plum Tomatoes and Tomato Paste (with 2 bay leaves) and let come to a boil. 8. Add another cup of beef broth if you like (always add 1 cup at a time, allowing the chili to boil, then adding second cup if need be). 10. Add sugar, oregano, salt, pepper, cinnamon and more chili Powder and Tabasco sauce (if you dare for more heat). 11. Finally add the chopped cilantro and lime juice. 1. While Chili is simmering throw in the fried pork bellies that were previously set aside. Mix all and let simmer, stirring occasionally. 2. When Chili boils and starts to bubble, reduce the heat and let simmer until the desired consistency is reached. 3. It’s ‘best’ to make this a day or two before serving as the flavors will gel. Serve garnished with A dollop of sour cream with lime zest, thinly-sliced Poblamo peppers and cilantro on top.